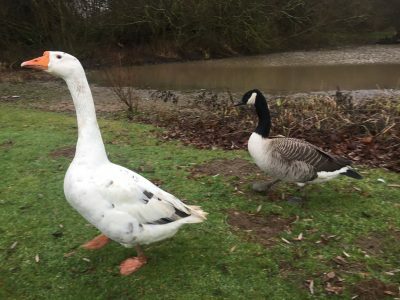 Posted by Jon in News, Rehomed on Tuesday 15/01/2019 20:59 UTC. Also this weekend we rehomed Garry and Ryan. 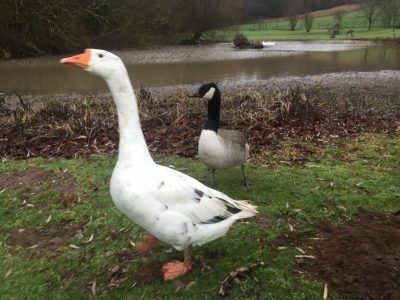 You may remember Ryan, he came to us as an orphaned Canadian gosling last spring. When his mother left her nest with her brood, Ryan misjudged the jump and fell over a wall and became separated. We took him in and successfully hand reared him. We did try to release him once he could fend for himself, but unlike other animals we have released, Ryan seemed to know what side his bread was buttered, he wouldn’t go and wanted to come home! 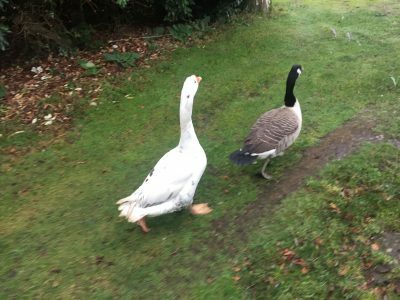 Later in the summer Garry an Embden goose came in, he was a young stray. Gary and Ryan (who we now know to be a girls) met and it soon became love at first honk!! This happy pair now live in a new home where there is a private lake with plenty of space and other geese for them to talk too. View more posts in News, Rehomed or browse all posts.You can follow this story via its RSS 2.0 feed.